One of the simplest DIY solar projects is to make your own solar battery charger using a small Photovoltaic (PV) solar panel to charge up some AA or AAA cells. Rechargeable batteries – AA NiMH or AAA NiMH cells. £1-2 each. Plastic battery holders with leads. £0.20-£1.00. Solar panel. £depends on size and voltage. e.g. 3 Volt Solar Panel and 6 Volt Solar Panel. We no longer sell solar panels or rechargeable batteries in the REUK Shop as availability and pricing is so much better now than it was when we first wrote this article back in 2006. However, if you are interested in putting together a solar battery charger and having any difficulty sourcing the necessary bits and pieces, feel free to email neil@reuk.co.uk with details of your exact requirements and we will help you with the specifications and point you in the right direction. Pictured above is a battery holder for one AA battery. Battery holders are available in a range of sizes from 1 AAA to 8 or even 10 AA batteries. Use the one which is suitable for your needs. The size of the solar panel required depends on the number of batteries you intend to charge and on their capacities. Note that all batteries charged at the same time should have the same capacity. Each rechargeable AA or AAA NiMH battery is rated at 1.2 volts (compared to 1.5V for alkaline batteries) and needs a charging voltage of around 1.3-1.4 volts to reach full capacity. Therefore if you want to charge 4 x AA batteries you would need a 6 or 9 volt solar panel. Ideally you should not charge a battery with more than 10% of its capacity as current if you cannot guarantee that you will always stop charging immediately when the battery reaches full charge – for example, charge a 2,000mah capacity battery with a current of 200ma or lower to be safe. Keeping the charging rate down is particularly important when the batteries are nearing full charge and far less important when they are fully discharged and you want to quickly bring them back up to charge. If you break the 10% rule with fully or nearly fully charged batteries then overcharging can occur generating heat and potentially damaging the battery beyond repair. A diode is used to prevent the batteries’ charge being dissipated back through the solar panel when it is dark. A 1N5817 Schottky diode is perfect for the job as only 0.2 Voltsare dropped as the current from the solar panel passes through it. If you have a Germanium Diode these are also excellent, and if you only have silicon diodes such as the common 1N4001, that is usually better than nothing although they drop 0.7 Volts. Detailed instructions on putting together a simple solar charger like this are now available in our articleBasic 4 AA Solar Battery Charger Plans. These plans can be used as the basis for all solar battery chargers whether you are making a 1 AAA battery charger, a 4 AA battery charger, or a much larger battery charger. 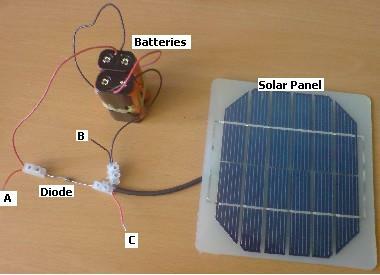 This very basic solar charger can be improved (made more flexible) by adding a current limiting circuit. Click here to find out how to Make a Solar Battery Charger with an LM317T. The LM317T is a cheap electronic component (cost under £1) which can also be used to regulate current. Therefore you can safely charge batteries with a larger solar panels without the batteries overcharging or overheating. Very useful if you already have a 12 Volt charging solar panel you would like to use to charge AA and AAA batteries.